Participants in the ongoing discussion about how to remedy centuries of economic inequality experienced by African Americans generally fall into one of two camps. One group calls for explicitly race-based or racially targeted solutions, while the other group supports race-neutral, or universal, progressive economic policies and programs. This brief focuses on the damage done to typical black workers’ wages in recent decades and demonstrates that progress on both fronts is necessary to undo the damage. Specifically, widening black-white wage gaps and growing overall wage inequality between 1979 and 2015 imposed a dual penalty on black workers’ wage growth. Therefore, a dual strategy is necessary to put black workers’ wages back on a trajectory that lets them share in the fruits of overall economic growth while also closing persistent gaps with white workers. Blacks are paid less than whites and the gap is growing, particularly among high earners. Specifically, the black-white wage gap—the percent by which wages of black workers lag wages of their white peers—has grown over time and at all levels of pay, but the gap is largest among the highest earners. All median workers are paid less than they should be given their increasing productivity. Since 1979, median wage growth overall has fallen far short of productivity growth, which is a measure of the additional output or income generated in an average hour of work. Stated another way, rising productivity has provided the potential for substantial pay increases for typical workers but this potential has not been realized, as the fastest wage growth has been concentrated among the highest earners. This is the defining feature of increased wage and income inequality. Closing the 26.2 percent racial wage gap alone would have raised hourly wages of the median black worker by $5.03 in 2015. Closing the racial wage gap and ensuring that median wages grew with productivity would have raised hourly wages of the median black worker by $12.33 in 2015 (from $14.14 to $26.47)—an increase of 87.2 percent. Addressing both class and racial inequality in this way would have also raised the hourly wages of the median white worker by $7.30 (from $19.17 to $26.47)—an increase of 38.1 percent. The black-white wage gap is defined by Wilson and Rodgers (2016) as the percent by which wages of black workers lag wages of their white peers. In 2015, the gap for the median (50th percentile) worker was 26.2 percent. Wilson and Rodgers also provide a detailed analysis of trends in average hourly black-white wage gaps among men and women who are full-time workers with similar levels of education and experience, live in the same region of the country, and have the same metro status (urban or rural). We find that even after controlling for these observed worker characteristics, a significant black-white wage gap remains and this remaining difference in pay is largely the result of discrimination. In fact, African Americans who have ascended the wage ladder through increased education and better access to higher-paying jobs also earn less than similarly situated whites. Interestingly, over the last 36 years, racial wage gaps have grown most among the most highly educated (those with a bachelor’s degree or more education). We (Wilson and Rodgers 2016) further conclude that while racial discrimination was the largest single factor driving growing differences in the pay of white and black workers between 1979 and 2015, increased overall wage inequality consistently played a role as well. One of the most pronounced features of growing wage inequality over the last nearly four decades has been the increasing gap between productivity growth, which represents the potential for wage growth, and actual wage growth for the vast majority of all workers, regardless of race or gender. Because black workers tend to cluster lower in the wage distribution than white workers, and because between 1979 and 2015 hourly wages grew most in the higher parts of the wage distribution, this rise in overall wage inequality mechanically separated black and white workers’ wages. The brief exception to this trend occurred between 1995 and 2000 when strong economic growth, tight labor markets, and widely shared economic prosperity produced slightly faster wage growth for African Americans than whites. As a result, racial wage disparities narrowed over this five-year period, but not nearly enough to completely close the gaps. Imagine for a second that it is 1979, and policymakers established a goal of completely eliminating racial wage gaps by 2015. A smart observer in 1979, asked to guess how much the median black worker’s hourly wage would rise by 2015, might assume that overall median wages would track economy-productivity growth over the next 46 years. After all, median wages had kept pace with productivity over most of the period since World War II. So our observer might add to this baseline rate of growth additional growth of black workers’ wages needed to close racial wage gaps. Neither of these things happened. Overall median wages did not track productivity growth and racial wage gaps did not close, but instead widened. This kept wage growth for black workers much, much lower than it would have been otherwise. In order to more explicitly demonstrate the dual penalty on wage growth of black workers, this section presents data showing trends in median wage growth, the black-white wage gap, and productivity growth since 1979. While most of the discussion is based on trends at the median, we also compare wages and wage growth of black and white workers at the 10th and 95th percentiles to show how these trends intersect with growing inequality. Mathematically, the median wage is the hourly wage in the middle of the wage distribution, with half of workers earning less than the median and half earning more. Since the median wage is often associated with the “typical” worker wage, and thus the standard of living for the middle class, trends in racial wage gaps and wage growth at the median provide a useful benchmark for the state of racial economic inequality, mobility, and middle-class quality of life in the United States. Table 1 shows real hourly wages of black and white workers at the 10th, 50th (median), and 95th percentiles of the wage distribution, along with the corresponding black-white wage gap at each percentile, and the ratio of the 95th percentile wage to the median wage by race. While the wage gaps reported in the table have not been adjusted for racial differences in worker characteristics, comparing relative wages of workers within the same wage percentile indirectly limits comparisons to workers who are more likely to be of similar education and skill levels. We present these data for the business cycle peak years of 1979, 1989, 2000, and 2007, as well as for 1995 (the point during the 1990s business cycle after which wages grew dramatically) and for 2015 (the last year for which data are available). 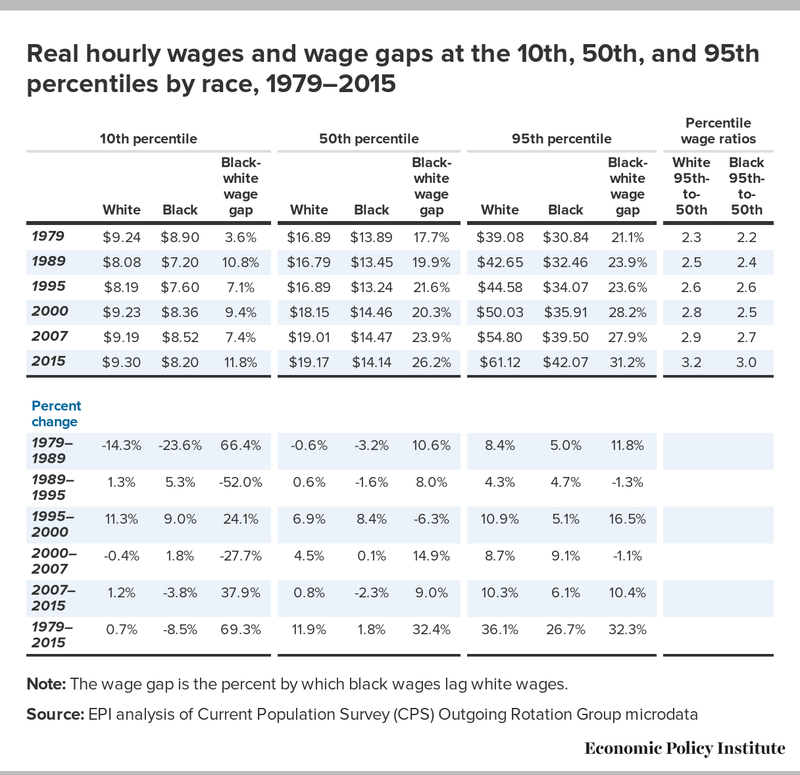 The data in Table 1 clearly show the intersection of three trends between 1979 and 2015: 1) limited wage growth at the middle and lower end of the wage distribution, 2) growing class inequality as indicated by the increasing ratio of 95th-to-50th percentile wages, and 3) growing racial inequality demonstrated by increasing black-white wage gaps. Table 1 also shows that while strong wage growth has eluded moderate- and low-wage workers of both races over much of the last 36 years, to the extent that wages have grown at all, most of the growth happened in a single episode between roughly 1995 and 2000. In almost every economic cycle preceding and following the late 1990s boom, wage growth of black and white low- to middle-wage earners was nearly flat or negative. Between 1979 and 2015, the median black wage grew a meager 1.8 percent, while the median white wage grew 11.9 percent. Consequently, the black-white wage gap at the median increased from 17.7 percent in 1979 to 26.2 percent in 2015. Wages trends have been even more disappointing for low-wage earners. From 1979 to 2015, wages at the 10th percentile declined 8.5 percent among black workers, and grew, but only by 0.7 percent, among whites. Although the racial wage gap is smallest among low-wage workers, that gap has more than tripled since 1979. Minimum-wage laws have a lot to do with patterns in black-white wage inequality at the lower end of the wage distribution. By setting a wage floor, the minimum wage compresses wages at the bottom so that employers have limited discretion in deciding how much to pay workers. However, since states and some cities have the authority to set their own minimum wages as long as they exceed the federal minimum wage, low-wage pay varies based on where workers live. Blacks disproportionately live in the Southern and Midwestern regions of the country where state minimum wages are generally lower than (or non-existent) and have been increased less frequently than in the Northeast or West. As a result, fewer low-wage black workers benefitted from state and local minimum-wage increases enacted over the last couple years, expanding the 10th percentile black-white wage gap from 7.4 percent in 2007 to 11.8 percent in 2015. The highest-paid workers have seen the greatest wage growth between 1979 and 2015. Even during periods when median and 10th percentile workers lost ground, the hourly wages of those in the 95th percentile continued to increase. This feature in the data demonstrates growing class inequality—a widening gap between what workers at the top earn compared with everyone else. For example, 95th percentile workers earned a little more than twice the median worker of the same race in 1979; by 2015, 95th percentile workers earned at least 3 times the median worker of the same race. Yet, even among the highest earners, for whom wage growth has been relatively strong, racial wage gaps persist and have expanded. In fact, racial wage gaps grow larger as pay increases. In 1979, the 95th percentile black worker earned 21.1 percent less than the 95th percentile white. By 2015, this gap had expanded to 31.2 percent, compared with a gap of 26.2 percent at the median and 11.8 percent at the 10th percentile. While growing racial wage gaps and the lack of wage growth among middle- and low-wage workers is disappointing enough, these patterns are even more troubling given the potential for better outcomes. 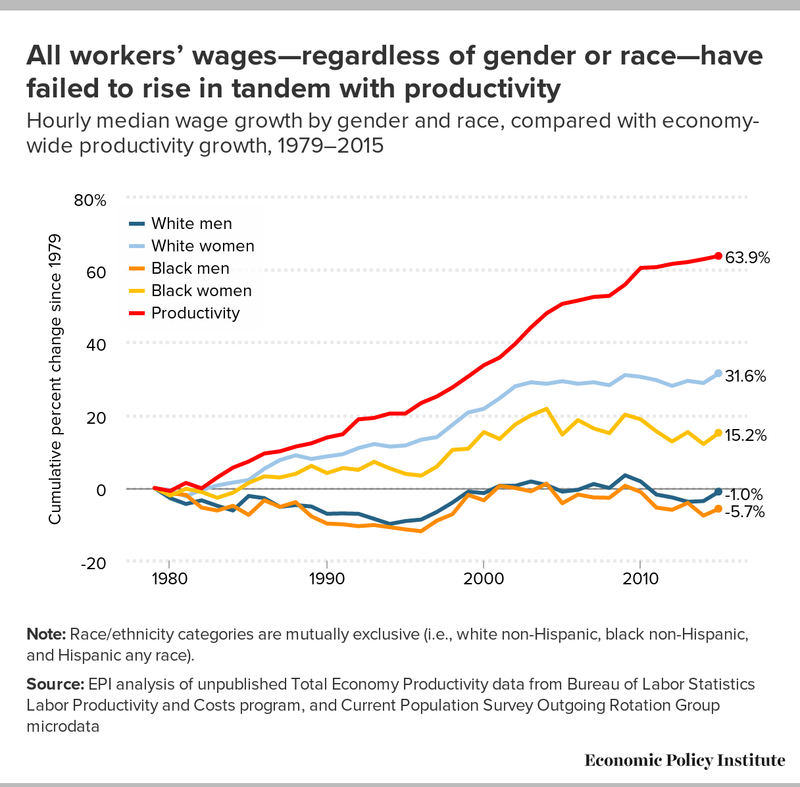 Figure A shows that between 1979 and 2015, median hourly real wage growth fell far short of productivity growth—a measure of the potential for pay increases—for men as well as women and for black and white workers. However, there have been clear differences in wage growth trends of men and women, and of blacks relative to whites. These differences have determined the pattern of race and gender wage gaps. Median hourly wages of white and black men both fell, with black men suffering greater losses (of 5.7 percent, compared with losses of 1.0 percent for white men). On the other hand, median hourly wages of black and white women increased, but white women’s wages grew much more (31.6 percent) than those of black women (15.2 percent). The distinct patterns of wage growth for men and women also contributed to improved gender equality in pay over this same period. Davis and Gould (2015) report that 40 percent of the narrowing in the gender wage gap over this period occurred because of falling men’s wages. So what have wage stagnation and racial pay discrimination cost black workers? In order to answer this question, let’s consider a couple different scenarios. Under the first scenario, if all we did was eliminate the 26.2 percent wage disadvantage of the median black worker by raising black workers’ pay to that of whites, this would be equivalent to an hourly increase of $5.03—the difference between white and black wages at the median in 2015. In this example, we only address racial inequality, leaving class inequality and white wages unchanged. Under the second scenario, we assume that the 1979 racial wage gap at the median had closed by 2015, or that all workers earned the overall median, and that the overall median ($16.15 in inflation-adjusted 2015 dollars, not shown in Table 1) had grown with productivity (63.9 percent) between 1979 and 2015. Under this scenario, the median black worker would be earning an hourly wage of $26.47 instead of $14.14—an increase of $12.33. That means the hourly wage of the median black worker would be an astounding 87.2 percent higher! But, under this scenario, the median white worker would also receive an hourly pay increase of $7.30—the difference between $26.47 and $19.17—boosting their wages by 38.1 percent. By addressing both class and racial inequality, all workers are made better off, with much larger gains for African Americans because of the dual penalties imposed by class and race. There is no doubt that black workers and their families would be better off if paid the same as comparable white workers, but the benefits of racial equity will be limited if wage growth continues along the same lackluster path it has been on for nearly four decades. The full benefits of equity are achieved when all workers share in the economic prosperity they help to produce. This happens when all workers’ wages grow with productivity. This paper was made possible by a grant from the Peter G. Peterson Foundation. The statements made and views expressed are solely the responsibility of the author. Current Population Survey Outgoing Rotation Group microdata. Various years. Survey conducted by the Bureau of the Census for the Bureau of Labor Statistics [machine-readable microdata file]. Washington, DC: U.S. Census Bureau. Davis, Alyssa, and Elise Gould. 2015. Closing the Pay Gap and Beyond: A Comprehensive Strategy for Improving Economic Security for Women and Families. Washington, D.C.: Economic Policy Institute. Wilson, Valerie, and William M. Rodgers, III. 2016. Black-White Wage Gaps Expand with Rising Wage Inequality. Washington, DC: Economic Policy Institute.